A little guide on how and where to play volleyball in Cabarete. There really is never a dull day here in Cabarete. Our backyard is an activity hub for watersports, beach fun, shopping, eating and relaxing! But nothing completes the day at the beach like a classic game of volleyball. 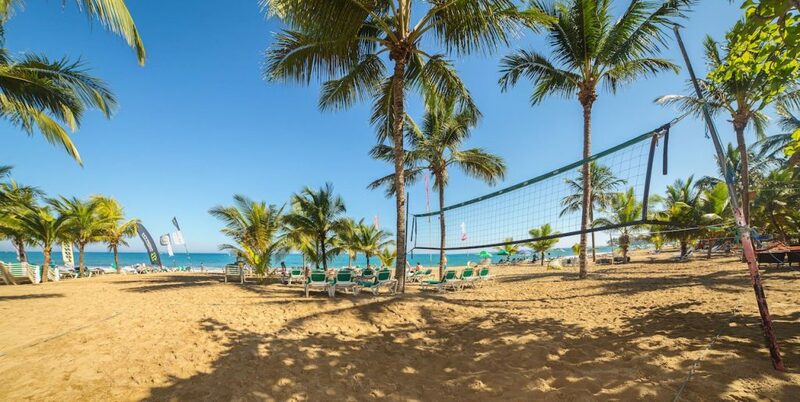 Whether you’re a complete beginner or a seasoned pro, all levels are welcome to jump in and play volleyball in Cabarete. Perhaps we speak for ourselves when we say this, but for some of us even just hitting the ball can be a challenge, let alone the thought of a match! Well, you’ll be surprised to know, coming from a total beginners perspective, that a volleyball match is a whole lot of fun and laughs. All you need is a net, a ball, you and 5 of your friends and another team to play. If you need to make up numbers, more players and teams are pretty easy to source here in Cabarete. For those who have never played a match, the rules are simple but important to know as there’s more to it than just hitting a ball back and forth. Even for those more experienced players, it’s always good to brush up on the rules to save disputes. Firstly, as opposed to playing a volley, the aim of a match is to hit the ball over the net so the opposing team are unable to return it or stop it from hitting the ground. Each team has 3 hits to attempt to return the ball. If the team receiving the serve wins a volley, they win the right to serve and the players rotate one position clockwise. If the team serving wins the volley, they win the point and continue serving. A game is played to 21 points. The team that wins two out of three games is the overall winner of the match. We have two volleyball nets here in Cabarete. There is one right in front of our hotel, and another in front of Voy Voy. They are free for everyone of all levels to use, you just need to bring your own volleyball. Don’t worry about bringing one from home, unless you have a fancy pants volleyball. You can easily purchase one for cheap at one of the local stores. Once you’ve gathered your team, had some practice and are feeling strong, you can sign up for the weekly tournament. It takes place every Thursday at 9:30pm at Voy Voy. Choose your team name, colors and you’ll even have a little audience to cheer you on!